Horace Grant battles for a jump ball versus Memphis Grizzlies Pau Gasol in November 2003. The 2003–04 NBA season was the Lakers' 56th season in the National Basketball Association, and 44th in the city of Los Angeles. The Lakers entered the season following a disappointing 2nd round exit to the San Antonio Spurs. During the offseason, Lakers center Shaquille O'Neal successfully recruited veteran free agents and former All-Stars Karl Malone and Gary Payton to the Lakers, in the hopes of getting the two an NBA ring; the team was also able to re-sign free agent Horace Grant during the off-season. Following these acquisitions, the Lakers were considered heavy favorites to win the title, but problems arose that would set the tone for the season to come. During the 2003 off-season, superstar guard Kobe Bryant was accused of sexual assault in Colorado. The media attention surrounding the case would prove to be an ongoing distraction for the team, as Kobe would miss certain games because he could not fly back in time from Colorado, where the trial was held. On top of the trial, Kobe's feud with Shaq would reach a peak during the season, as both players would consistently criticize each other to the media for their respective influences on the team. Shaq questioned Kobe's leadership roles and often refused to acknowledge his presence on the team during press conferences and media statements, while Kobe targeted Shaq's public efforts to have his contract extended by the Lakers, and criticized Shaq's lack of contact with him during the off-season. The team's big free agency signings weren't faring much better, as Payton struggled with coach Phil Jackson's triangle offense, which limited his ball-handling and post-up opportunities, and Malone would deal with injury issues that kept him off the court for extended periods of time. In total, O'Neal, Bryant, Malone, and Payton would play only 20 games together. Despite all of the setbacks, however, the Lakers still managed a 56–26 record and entered the playoffs as the number two seed in the Western Conference. In the playoffs, they defeated the Houston Rockets, the San Antonio Spurs, and the Minnesota Timberwolves to advance to the NBA Finals where they would meet the Detroit Pistons. The Lakers entered the Finals as the heavy favorites, but the team unraveled, as the Pistons' strong defense and teamwork triumphed the Lakers in just five games. The tension continued into the off-season, as the Lakers would see major changes in the 2004 off-season. The Lakers opted not to extend Phil Jackson's contract, resulting in his dismissal from the team. Shaquille O'Neal requested a trade, to which he was traded to the Miami Heat in a blockbuster deal, allowing Kobe Bryant to sign an extension with the Lakers, enabling him full leadership of the team. Gary Payton and Rick Fox were both traded to the Boston Celtics, and Karl Malone opted not to re-sign with the team; he would retire the following year. Despite their feud and Kobe's ongoing trial, O'Neal and Bryant were voted to play in the 2004 NBA All-Star Game, which was hosted in Los Angeles; O'Neal was named the game's MVP. The team's season roster is featured in NBA 2K18. 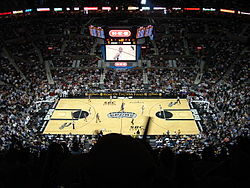 The Lakers playing against the San Antonio Spurs in Game 1 of the 2004 Western Conference Semifinals at the SBC Center. (OT) denotes a game that required overtime. The Finals were played using a 2-3-2 site format, where the first two and last two games are held at the team with home court advantage. This is only used in the Finals, all other playoff games are held in a 2-2-1-1-1 format (the team with home court advantage starts). The Lakers had a lineup of stars such as Karl Malone, Gary Payton, Kobe Bryant, and Shaquille O'Neal - their offensive capability was expected to overpower Detroit's defensive-based gameplan. Payton and Malone also added to the publicity of the Finals. Perennial All-Stars who had both previously reached the Finals, Payton had led the Seattle SuperSonics there in 1996, while Malone had led the Utah Jazz there in 1997 and 1998. However, Michael Jordan and the Bulls denied them championship rings a total of three times. By the time of Jordan's retirement in 2003, the two veterans were aged and failed to lead their teams deep into the playoffs. Thus, this Finals series was seen as the last chance for two of the greatest players in NBA history to finally become NBA champions (Later on, Malone retired while Payton became a champion as a key bench player for the Miami Heat). Sunday, June 6, 2004, 14:30 at the Staples Center. Considered to be a stunning upset by most of the NBA world, the Detroit Pistons managed to defeat the Lakers with imposing defense. Defensively clamping down on everyone but Bryant and O'Neal, the Pistons managed to hold everyone else to a total of 16 points. The Pistons trailed the Lakers 41–40 at halftime, but a 10–4 surge capped by Billups's 3-pointer gave the Pistons the lead. O'Neal's foul trouble furthered the scoring gap, with the Pistons leading by 13 points early in the fourth quarter. Tuesday, June 8, 2004, 15:04 at the Staples Center. The second game was close throughout the first half, but in the third quarter Detroit would score 30 points, cutting the deficit 68–66. However, at the end of the fourth quarter, Kobe Bryant's 3-point shot at 2.1 seconds to go would tie the game at 89–89. The Lakers and Pistons would then go to overtime, with the Lakers outscoring the Pistons 10–2. Thursday, June 10, 2004, 14:31 at The Palace of Auburn Hills. The Pistons beat Los Angeles by 20 in their first NBA Finals appearance together at The Palace of Auburn Hills since 1989 to take a 2–1 lead in the series. The 68 points scored by the Lakers set a franchise record for the fewest number of points scored in a playoff game. Previous night, a group of overzealous Pistons fans made it difficult for the Lakers to get their rest by harassing them until 4am at their hotel in nearby Birmingham. Fans were screaming outside the building until management at the hotel called the police. Sunday, June 13, 2004, 14:49 at The Palace of Auburn Hills. Again, the Pistons defeated the Lakers, although this time by eight, to take a 3–1 series advantage. Tuesday, June 15, 2004, 14:32 at The Palace of Auburn Hills. In Game 5, the Pistons won their first championship since 1990, and Larry Brown finally won his title. The Pistons defense had overcome the high-scoring Laker offense, winning the game by 13, winning the series 4-1, and also ending a long Laker dynasty that lasted for many years. 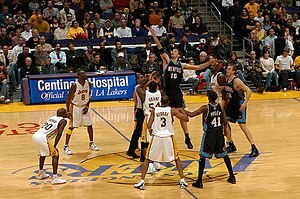 The game saw the end of Phil Jackson's first run as the coach (he returned for the 2005-06 season), and saw O'Neal, Payton, and Malone's last games in Laker uniforms (O'Neal and Payton were both acquired by the soon-to-be NBA Champions Miami Heat and Malone retired). ^ "Lakers Sign Free Agents Gary Payton and Karl Malone". NBA.com. Turner Sports Interactive, Inc. July 16, 2003. Retrieved April 20, 2011. ^ Lazenby, Roland (2006). The Show: The Inside Story of the Spectacular Los Angeles Lakers in the Words of Those Who Lived It. New York, New York: McGraw-Hill Professional. p. 422. ISBN 978-0-07-143034-0. ^ Wise, Mike (October 4, 2003). "Pro Basketball; With Bryant Absent, Lakers Begin Practicing". The New York Times. Retrieved April 20, 2011. ^ May, Peter (October 28, 2003). "Lakers are a lock -- for turmoil". The Boston Globe. Retrieved April 20, 2011. ^ Buerge, Daniel. "A Complete Timeline of the Shaquille O'Neal, Kobe Bryant Feud". Lakers Nation. Retrieved 2 April 2013. ^ DuPree, David (May 4, 2004). "Changing of guard not easy". USA Today. Archived from the original on November 7, 2012. ^ Adande, J. A. (November 6, 2012). "West Side: Mike Brown's O is working". ESPN.com. Archived from the original on November 7, 2012. ^ Brown, Tim. "Malone Out for a While". Los Angeles Times. Retrieved 29 January 2004. ^ "Coach could move to another Lakers job". ESPN. Associated Press. Retrieved 21 June 2004. ^ "Kobe remains with Lakers". ESPN. Associated Press. Retrieved 16 July 2004. ^ "Basketball: NBA Playoffs 2007 preview". betinf.com. Retrieved 2007-09-03. ^ a b "Utah Jazz". CBS Sports. Retrieved 2007-09-04. ^ "Seattle Supersonics". CBS Sports. Archived from the original on 26 August 2007. Retrieved 2007-09-04. ^ "DETROIT PISTONS HISTORY". Basketball Tickets. Archived from the original on 2007-08-06. Retrieved 2007-09-03. ^ Press, From Associated (2004-06-13). "Lakers Facing Uphill Battle". Los Angeles Times. ISSN 0458-3035. Retrieved 2017-02-13. This page was last edited on 12 April 2019, at 14:32 (UTC).